OLYMPIA – Razor clam diggers can return to various ocean beaches for a three-day opening beginning Saturday, April 6 and extending through the following Monday. State shellfish managers with the Washington Department of Fish and Wildlife (WDFW) approved the dig on morning low tides after marine toxin tests showed the clams are safe to eat. Beachgoers should note a change from the tentative schedule announced earlier. Shellfish managers canceled the April 6 razor clam dig at Copalis and replaced it with a dig just down the road at Mocrocks beach. Ayres recommends that diggers hit the beach about an hour or two before low tide for the best results. All diggers age 15 or older must have an applicable 2019-20 fishing license to harvest razor clams on any beach. 2018-19 licenses will no longer be valid for this dig. Licenses, ranging from a three-day razor clam license (starting at $9.70) to an annual combination fishing license, are available on WDFW's website at https://fishhunt.dfw.wa.gov and from license vendors around the state. WDFW is the state agency tasked with preserving, protecting and perpetuating fish and wildlife and ecosystems, while providing sustainable fishing, hunting and other outdoor recreation opportunities. WDFW razor clam digs support outdoor lifestyles and coastal economies. "While diggers should be prepared for both rain and sunshine, spring is a great time to gather clams and share a fun experience on the beach with friends and family," said Ayres. WDFWis the primary state agency tasked with preserving, protecting and perpetuating fish and wildlife and ecosystems, while providing sustainable fishing and hunting opportunities. The agency uses pre-season stock assessments and monitoring to ensure conservation of clams for current and future generations. WDFW razor clam digs support outdoor lifestyles and coastal economies. 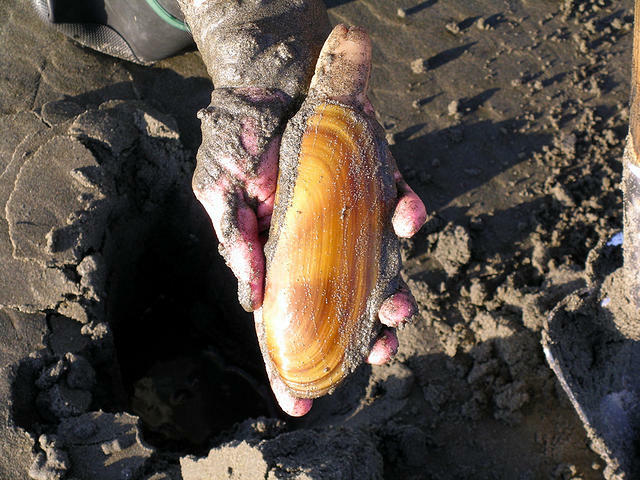 More information is available on WDFW's razor clam webpage at https://wdfw.wa.gov/fishing/shellfish/razorclams/. OLYMPIA – Razor clam diggers can return to ocean beaches for a two-day opening, Mar. 16-17, which coincides with the Ocean Shores Razor Clam and Seafood Festival in Ocean Shores, Washington (https://www.osrazorclamfestival.org). For more clamming tips, festival goers can visit Ayres and his shellfish team at their information booth at the event. Ayres will be giving presentations on how to dig razor clams and how WDFW manages the season. The Department sets these dates when possible to coincide with the local razor clam festival, knowing the importance it has for the local economy. More information can be found on WDFW's razor clam webpage at https://wdfw.wa.gov/fishing/shellfish/razorclams/. The Washington Department of Fish and Wildlifeis the primary state agency tasked with preserving, protecting and perpetuating fish and wildlife and ecosystems, while providing sustainable fishing and hunting opportunities. WDFW razor clam digs support outdoor lifestyles and coastal economies. 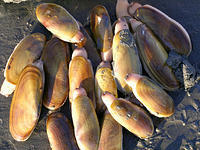 OLYMPIA – State shellfish managers have tentatively scheduled razor clam digs on ocean beaches for 12 days starting Mar. 16 and extending into late April. Final approval of all scheduled openings at Copalis, Mocrocks, Long Beach, Kalaloch and Twin Harbors beaches will depend on whether results of marine toxin tests show the clams are safe to eat. The Washington Department of Fish and Wildlife (WDFW) typically announces whether a dig will go forward about a week before the opening, said Dan Ayres, coastal shellfish manager for the department. Ayres noted the first three digs in March are on evening low tides, while those that follow are on morning low tides. No digging is allowed before noon during evening digs and digging must be completed by noon during morning digs. WDFW will consider additional dates later this spring if enough clams remain available for harvest, Ayres said. All diggers age 15 or older must have an applicable fishing license to harvest razor clams on any beach. New 2019-20 fishing licenses will be required for dates in April. Licenses, ranging from a three-day razor clam license (starting at $9.70) to an annual combination fishing license, are available on WDFW's website at https://fishhunt.dfw.wa.gov and from license vendors around the state. The Washington Department of Fish and Wildlife is the primary state agency tasked with preserving, protecting and perpetuating fish and wildlife and ecosystems, while providing sustainable fishing and hunting opportunities. WDFW razor clam digs support outdoor lifestyles and coastal economies. OLYMPIA – Razor clam diggers can return to various ocean beaches for a seven-day opening beginning Friday, Feb. 15. The dig extends over a long weekend and provides a Saturday digging opportunity at Long Beach. "Razor clams are fun to gather and great to eat, and the seven-day schedule should provide opportunities for diggers to find a time to gather their clams for late winter get-togethers with friends and family," said Ayres. Please remember to check with Washington Department of Fish and Wildlife for last minute changes to the razor clam digging , rules and regulations. Copalis Beach, which extends from the Grays Harbor north jetty to the Copalis River, and includes the Copalis, Ocean Shores, Oyhut, Ocean City and Copalis areas. 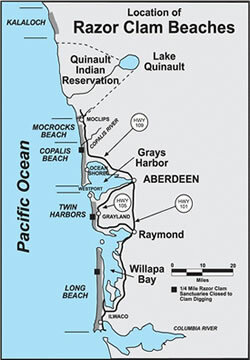 Mocrocks Beach, which extends from the Copalis River to the southern boundary of the Quinault Reservation near the Moclips River, including Iron Springs, Roosevelt Beach, Seabrook, Pacific Beach and Moclips. Twin Harbors Beach, which extends from the mouth of Willapa Bay north to the south jetty at the mouth of Grays Harbor. Long Beach, which extends from the Columbia River to Leadbetter Point. Kalaloch Beach, which extends from the South Beach Campground to Brown’s Point (just south of Beach Trail 3) in the Olympic National Park.